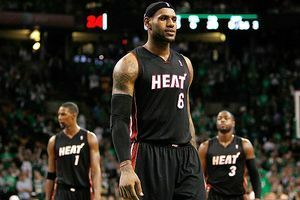 » LeBron and Wade: Can it work? In Michael Eisner’s thoughtful book about partnerships, he tells a story about getting wooed by Disney in 1984. The company arranged a meeting between Eisner, one of its corporate lawyers and a former Warner Brothers executive named Frank Wells. Eisner expected to be offered control of the company, but there was an unexpected twist: Disney actually wanted him to share power with Wells. Co-CEOs. So what did he know? Still in his 40s, Eisner had already thrived in a successful alliance with Barry Diller before Diller left Paramount a year earlier. He wanted to run an entertainment company himself; not just for the financial and creative upside, but because he needed to know, Can I do this? Can I be The Guy? He doubted that two competitive people could run a complicated company like Disney and, for lack of a better phrase, share the ball. With that many decisions to make, one person needs final say. It’s the same reason we would never have co-presidents or co-NFL coaches. Eisner realized all of these things in less than two seconds. Sitting a few feet away, Wells processed that same dilemma in those same two seconds. He was wired differently than Eisner, more of a free spirit and a thrill-seeker, someone who checked out of Hollywood for a few years to climb the tallest peaks in six different continents. You would never call him conventional. His next few words? Definitely unconventional. Eisner quickly agreed before Wells changed his mind. But Wells’ intentions were genuine. He had no problem becoming Eisner’s Scottie Pippen, an unselfish sidekick who filled in the blanks, didn’t care about his stats and took pride in helping his team reach its potential. As Eisner wrote later, “We learned that one plus one adds up to a lot more than two.” Their partnership thrived for a decade before Wells died in a tragic helicopter crash, but not before they had transformed Disney into a multimedia empire. And it only happened because, in the matter of a few seconds, Michael Eisner and Frank Wells arrived at two separate conclusions that basically meant the same thing. He’s right, that can’t work. So screw it, I’ll work for him. I kept thinking about that moment in Boston on Tuesday night, then in Philadelphia one night later, as LeBron James and Dwyane Wade launched the single strangest marriage in NBA history other than the Christies. Basketball is relatively simple. Teams win championships conventionally (an alpha dog superstar, an accomplished sidekick, a third elite player, than five or six role players) and unconventionally (three or four elite starters who complement each other, then four or five role players), but never radically. The Heat are thinking radically, even if it might not seem like it. They believe two alpha dog superstars — both perimeter players, both creators who need the ball in their hands, both franchise players who developed particular habits carrying inferior teammates these past seven years — can reinvent themselves as co-CEOs of a basketball team. I spent the next three months keeping an open mind. Couldn’t Chris Bosh flourish with better teammates and provide a consistent low-post threat? Couldn’t Udonis Haslem revive his career as a poor man’s Horace Grant? Wasn’t the thought of Mike Miller launching wide-open 3s a little frightening for opponents? Did they even need a traditional point guard when LeBron and Wade handle the ball so well? Why couldn’t LeBron tap into his inner Magic, become more of a facilitator and start piling up triple-doubles like NBC piles up bad ratings? And weren’t they saying all the right things? Defense matters, numbers don’t matter, we’re all about sacrifice, we want to win 10 titles and not just one … what was so radical about any of this? Fast-forward to Tuesday night, the best regular-season basketball game I’ve attended since the Larry Joe Bird era. Boston fans genuinely love this particular Celtics team, haven’t gotten over blowing the Six For Twenty-Four game, desperately want a Lakers rematch and couldn’t wait to send a special message to LeBron and the gang. We know everyone is already handing you the East, but you still have to go through us. During the pregame introductions, LeBron was showered with the angriest boos for a Boston opponent since Bill Laimbeer, a man who only tried to paralyze Bird during the 1987 playoffs. There was real hostility in the air. You could feel it. LeBron can spin this publicly however he wants, but you can’t hide on a basketball court. You’re wearing a sleeveless jersey, shorts, socks and sneakers. That’s it. If you’re angry, we can tell. If you’re happy, we can tell. If you’re frightened, we can tell. For instance, Bosh was scared sh*tless Tuesday night. He’d never played in a game like that before. He wanted no part of the crowd, Kevin Garnett’s swarming defense, the ball on the low post, his free throws, anything. (Not a good sign for Miami’s title hopes, by the way.) LeBron didn’t seem rattled, just angry. And not in a totally productive way. The best thing about Pre-Decision LeBron? How he connected with his teammates and fans. He wanted to win, he wanted to have a good time, he wanted to put on a show, he wanted to be liked, and most of all, he wanted to amaze. Watching Post-Decision LeBron talk cryptically about taking mental notes, retweet vicious messages, broach the race card and prance around preseason games with an Eff You edge was like seeing Will Ferrell play a war criminal or something. It just didn’t feel right. We knew the Decision would affect his career, but for how long? Was it a phase? Was it permanent? Would a Haterade overdose create that Jordanian edge we always thought he needed? Or would it nudge his career in the wrong direction? It took me about 20 minutes of Game 1 to figure it out. He’s still digesting how quickly everything flipped on him. In one hour of his televised announcement, he went from “loved and revered” to “excoriated and disgraced.” That would be distressing in itself, but remember, few celebrities care about protecting their own brand more than LeBron James. He probably expected the Miami decision to be controversial, then it would blow over in a few days and everyone would get jazzed about the new superteam. He never expected it would damage his brand and fundamentally change how America felt about him. No, seriously. He wants to know. They were thinking that on Tuesday night. All of them. They cracked under the pressure in the first half: shooting 27 percent, repeatedly turning the ball over, bricking free throws, bleakly going about their business, carrying themselves like young tennis players getting berated by overbearing fathers. And you know what? That wasn’t even the most fascinating subplot. In the first quarter, Wade and LeBron awkwardly coexisted like two lead guitarists jamming at a Rock and Roll Hall of Fame concert. Are you gonna go? Should I go? Wait, you want to go? How ’bout you take this one, I’ll take the next one. Neither Wade nor LeBron have ever been allowed to think, “I’ll get mine later.” Every time they played poorly or passively, their teams lost. They always had to be involved. They always had to attempt 20 to 27 shots per game, reach the line eight to 10 times and create 20 open shots for their teammates. There was no other way. It might be too late for them to change. 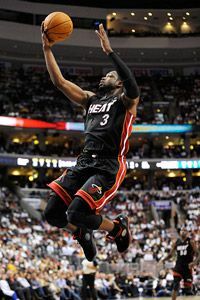 Wade is conditioned to have the ball in his hands, pick defenses apart and ride every hot streak. LeBron is conditioned to destroy guys off the dribble, take wide-open 3s and assault the rim whenever he can. You are who you are. Only a few basketball teams figured out how to balance the agendas of two superstars; every time, it took a major concession on someone’s behalf. West’s Lakers never won a championship until Chamberlain tapped into his inner Russell. Kareem’s Lakers benefited from Magic deferring for the first seven years, then assuming command as a scorer when Kareem’s game began to decay. You can’t win an NBA title without someone eventually saying, “I got this” and everyone else agreeing, “You’re right, you got this.” Miami isn’t there yet. I thought LeBron would make that sacrifice, but upon further review, Wade needs to reinvent himself as the team’s defensive stopper, facilitator, emotional leader and occasional closer (much like Kobe did on the 2008 Dream Team). Why? Because LeBron is better than him. In Boston, I was praying to myself, “I hope LeBron doesn’t decide to take over.” Wade was an afterthought. And yeah, he struggled that game … but I know what I saw, and I know how I felt. The only guy on the court who could stop LeBron on Tuesday night was Dwyane Wade. 1. Once Erik Spoelstra realizes that high screens with Bosh and LeBron/Wade are effectively unstoppable, that becomes the Heat’s signature play. And if he doesn’t realize it by Christmas, he’s going fishing with Pat Riley in Tahoe. 2. If Mike Miller is feeling it against a bad team that doesn’t rotate properly, he’s going to make at least 15 3s in one game. 3. If you have a bad second string and you’re going against LeBron or Wade — remember, they never rest both at once — you’re getting smoked. Those little runs add up. 4. Miami can’t win 70 games because it has three massive holes: no size upfront, no depth past the top five, and nobody to defend penetrating point guards (Rondo annihilated them Tuesday night). I see the Heat settling at 63 or 64 wins. 5. You know who has the most to gain with the 2010-11 Miami Heat other than LeBron and Wade? Dwight Howard. He could and should rip them apart much like Wilt ran amok in the 1960s against 6-foot-8 white guys who smoked butts at halftime. Does he have it in him? Will Howard ever be anything other than an awesome physical specimen who happens to play basketball only because it’s the sport that made the most sense for him?